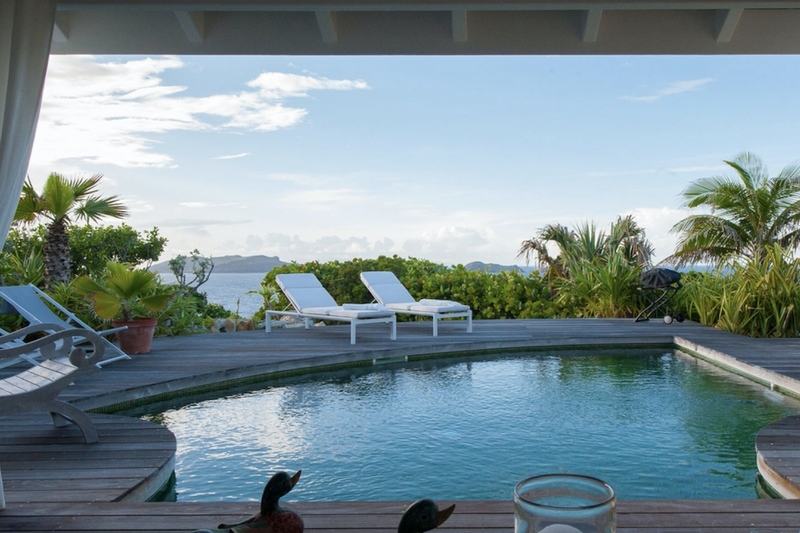 La Falaise is a secluded getaway for the couple that wants to bask in the beauty and luxury of St. Barts together. With one bedroom indoors and almost everything else either outside or within a three-walled room, La Falaise creates such a romantic and intimate atmosphere for you and your love. And don’t worry, there is A/C! Enjoy the outside kitchenette and dining area, a living room that is completely open to the waters of Pointe Milou, and a pool directly off of the living room. And when you want to spend time on the beach, Lorient Beach is just five minutes away by car. Perfect for those who love outdoor living! The larger pavilion contains the bedroom, which has a four-poster king-size bed, antique accent pieces, and an ensuite bathroom that has marble tiles. The second bedroom is situated in a semi-underground bungalow at the far end of the property. The room is spacious and divided into a seating area and a separate sleeping area with an European king sized bed and a small ensuite bathroom with shower. Outside this pavilion is a covered dining area for four and an outdoor kitchen, which has a stove and a microwave but no oven. In front of both is the pool deck, with sunbeds, lounge chairs and an unusually shaped swimming pool. Beyond it lies the abundant garden. And beyond that, of course, the sea. Extremely peaceful and private villa! Service was outstanding. Would definitely recommend! Sharon always gave information promptly when needed, very helpful!